All coins are delivered in specially designed coin cards that allow you to enjoy both front and reverse side of the beautiful coins. The dust-proof coin card protects the coins against dust and fingerprints, and preserves the special collection in perfect condition. 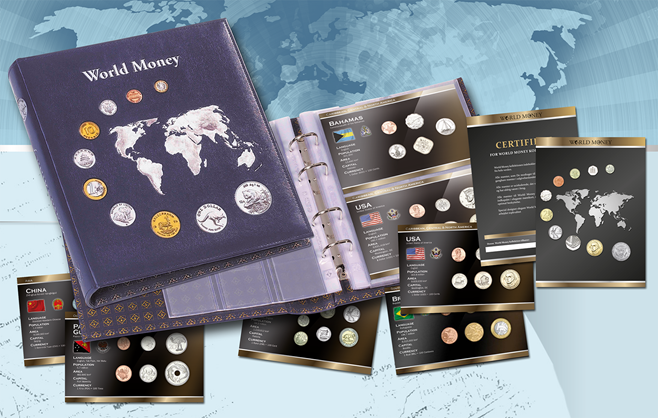 Look forward to building a collection of coins from countries across the world – a collection with large diversity! In the first shipment you will receive: four coin sets including a total of 24 different coins from interesting countries such as USA, Bahamas, Brazil and the United Kingdom. You will also receive a certificate guaranteeing the authenticity of all the coins, as well as two pages designed to hold the coin cards. Regular price 76.00 Euro. Subsequent shipments will each contain two different coin sets at the total price of 38.00 Euro. You will receive one shipment pr month. To ensure a correct storage and presentation of your collection you will receive an exclusive album from Lighthouse / Leuchtturm, which is known to be one of the best suppliers of coin accessories worldwide. You will receive the album free of charge in your third shipment - the regular price of the album is 20.00 Euro. All prices are exclusive of shipping. 14 days money back guarantee on all shipments. No binding period.